It was bad enough when Senator Harry Reid uttered Bryce Harper’s “clown question, bro” in response to a reporter’s question, killing it forever. 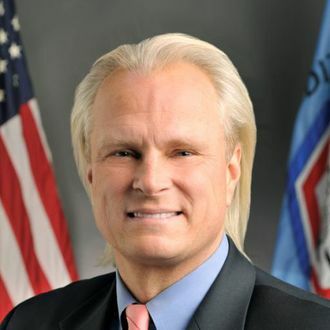 But the earth shook and wept for a few moments yesterday, when Bart Chilton, the golden-haired commissioner of the U.S. Commodity Futures Trading Commission, invoked the catchphrase while giving a statement about Dodd-Frank rulewriting. Thank you Mr. Chairman. There are a couple of important events coming up that I want to share with you today. First, tonight the All-Star game will be played. Also, in just 11 days, we’ll have the two-year anniversary of the signing of the Dodd-Frank Wall Street Reform and Consumer Protection Act. Now, some of you are asking, “How’s he going to put these two totally divergent things together?” It’ll all make sense in a minute. Really. First, how many of you have heard of Bryce Harper? He’s the youngest position player ever chosen for an All Star game and plays for what is for many of you, your hometown team, the Washington Nats. He not only has a way with the bat but he seems to have a way with words, too. A couple weeks ago, a reporter asked him what he seemed to think was a silly question, and he responded by saying, “That’s a clown question, bro.” That answer went on T-shirts. It went on late-night TV. It went viral. Let’s not even talk about 2008 and the financial collapse and the real reason Dodd-Frank came along in the first place. Let’s talk about how MF Global (as some would suggest) got caught trying to steal. Let’s talk about JPMorgan’s losing streak. Let’s talk about Barclays’ balk. Do we need Dodd-Frank? That’s a clown question, bro. So yes, we need rules. We need the funding to enforce them. Plenty of folks still seem to think they can get around the rules. Plenty of folks in this town seem to think we don’t need umpires. Do we? That’s a clown question, bro. So yes, the CFTC and other regulatory agencies are chronically underfunded, periodically inept, and have failed to catch more than a handful of major Wall Street frauds in the last decade. But take heart: At least their leaders display passing familiarity with month-old Internet memes. Repeal Dodd-Frank? Clown Question, Bro.